Message For Light Warriors – Game On! We are the way show-ers, the light bearers, the truth seekers, warriors of Gaia. We are not afraid. We open our hearts to love our greatest strength in this war of duality. We are not frightened. As humanity struggles to awaken from its deep slumber, we illuminate the demons, the darkness and their evil intentions. Lightworkers are being targeted by third and fourth dimensional entities seeking to undermine our inner peace, strength and belief in the power of love. We send love to all those fighting the darkness. The whistle blowers, empowered by the dissolution of barriers to truth are cracking open the viper’s nests. The programming is breaking down, cracks become fissures, gaping chasms of light pouring out into the world. The Atlantic is the eye of the storm of this great showdown. Like a tidal wave this great battle for human consciousness, human souls, human sanity is being activated. To run, to hide in fear is to feed their never ending lust for our energy, for our hearts and souls. The innocence of humanity must be protected as the battle commences. A huge mothership, a city in the sky, our allies, hover above the Atlantic ocean cloaked from human eyes. This ship and our allies aboard it are mounting a fresh attack as hostilities heighten. Blasting waves of high frequency photon light around the planet. The human elite are no longer in control. The war has stepped up. Our infiltrators are pressing the button for enhanced manipulation of our perceived synthetic reality. They seek to freeze us in time to halt the expansion of human consciousness. This great battle commences. We are part of it. Now is the time to activate your inner warrior, to ignite the fighter within you. Do not let fear take hold of your mind, lock down your heart or corrupt your soul. Release all negative entities from this world. Push back against their fear, their anger their greed and their darkness with the glory of joy, love and enlightened human consciousness. These are critical times friends. Do not give into fear. Protect yourself and loved ones. Sage, mantras, shield up, crystals and white magic are our best tools for protection. Close your mind to fear driven interference from hostile entities, by surrounding yourself in love frequency. Activate your heart chakra under protection from guides, angels and higher self. Connect to universal love frequency. Power up the pyramid of light that surrounds you and your loved ones. Call upon ascended masters and beings of true light to come to cocoon us in protective light. Do this before sleep. Game On beautiful people. Pull back the veils, brace yourself for energetic battle. Don’t be distracted by confused, aggressive, bewildered people unable to process or internalize the volatile atmosphere we are immersed in. Plant your feet firmly on Gaia, raise your arms to the heavens, open your heart chakra under protection and let ’em have it people. We are taking this planet and its people back from the brink of destruction, of implosion, of corruption. This is it. As lights dotted around the globe unite, connect the dots, reach out to each other energetically. We are vanquishing this malignant, demonic, hostile force. I am the truth seeker, the light bearer, the way show-er. I vanquish hate, fear, greed and depravity from this world. I step up to this battle. I seek to protect and free this world and its people from terror, from depravity and from trauma based mind control by raising the vibration one breath at a time. In light in love, in unity, I step up to this battle as a warrior of light. I stand strong ready to do battle for freedom. 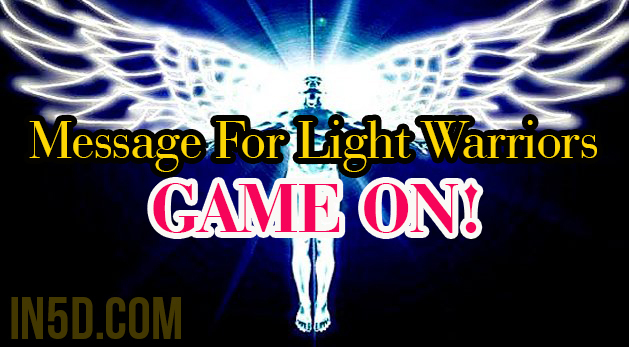 Tags: Message For Light Warriors - Game On!